This week Butterflies have been learning about body parts and the concept of risk taking. 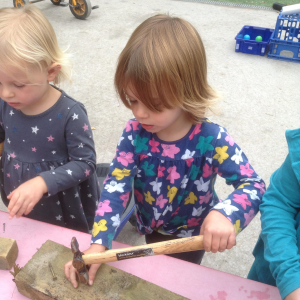 At the start of the week the children explored what risks may be involved when using tools. Discussions took place about how to prevent risks whilst using a screw driver and hammer. 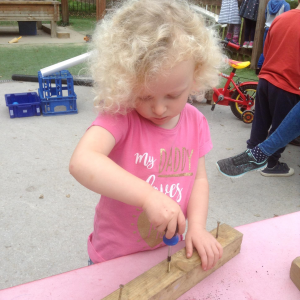 The children really enjoyed the leaning how each tool worked by putting screws and nails into wood. As well as splashing in muddy puddles, counting fingers and acting out animal movements the butterflies focused on body parts. 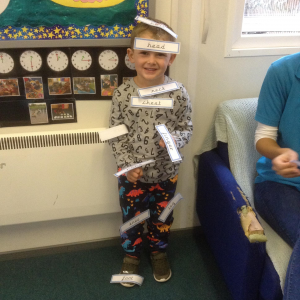 Using labels the children learnt lots of the body parts by sticking them onto one of the children. 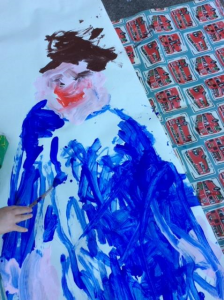 The Children then used their creative sides to measure and paint a painting of the tallest child in the Butterflies room. The finished painting is placed in the room on the door for parents and visitors to see.